Home / Cases / ICOM supplies composite raw materials for lifeguard towers. Dansk Polyglas A/S has so far built 26 lifeguard towers and 11 top modules in complex sandwich construction for TrygFonden. The towers and top modules are seen along the most popular Danish beaches and at the harbour baths in Copenhagen. The towers are manned with lifeguards who have important tools, such as defibrillators, motorboats, rescue boards and other first aid equipment at their disposal. The lifeguard towers were nominated for the Danish Design Award as an intelligent and stylish design. The lifeguard towers were exhibited at the Trapholt Museum in Kolding and at the prestigious Museum of Modern Art (MoMA) in New York. The towers are manufactured using thermoset composites, as well as flame retardant composite systems. Furthermore, a special coat, “Suncoat” is applied to the lifeguard towers which is exceptionally UV resistance. The distinctive red and white colours remain constant year after year, even in Denmark’s harsh westerly sea climate. This is remarkable in an environment where the towers are not only exposed to strong sunlight, but also large amounts of saltwater and UV reflection from the sea. 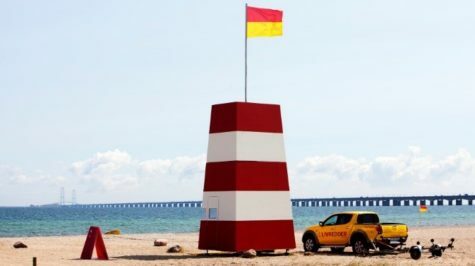 ICOM have supplied all of the composite raw materials, including Suncoat and bigHead, to TrygFonden’s lifeguard towers and, therefore, our products help to save lives. Dansk Polyglas manufactures the lifeguard towers that can stand the distance.